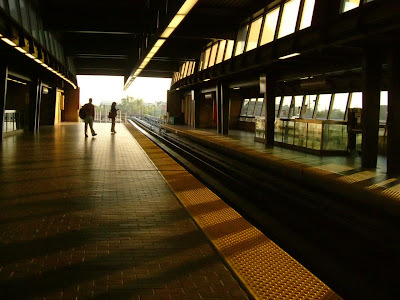 Our #TransitHubbing Adventures in Toronto: Transit Tales: Chapter 1 - "Aurora"
"Transit Tales" is a brand new series focused on your #TransitHubbing adventures and encounters on the subway or streetcar. In our very first chapter, Vipasha Shaikh (@PopsugarJunkie) shares the story of her very first ride on the subway, and her chance encounter with a girl called "Aurora". Enjoy! This story’s old. It’s really old. It’s from when I was in Grade 9, almost four years ago. I had finished my first grade of high school, and I was gearing up for a summer of epic volunteering. I decided to volunteer Downtown, because I hadn’t really gone there before. So I applied to be a volunteer at Fringe, and I got in! I was happy - thank god for that 100% acceptance rate. Okay, yeah I know. Both of the cars from Kennedy go all the way down to Kipling. But I wanted to make sure! The auburn-haired chick asked me - ‘Hey, where are you going?’. To which I said - ‘St. George! I have a volunteer shift at Hart House’. ‘Yeah …’ and the auburn-haired girl launched into a story about how it was the first rehearsal of Romeo and Juliet and how she didn’t really want to screw up, even though she had such a small part. And I replied by saying how I thought that was the coolest thing in the world, and in comparison, I was just at Hart House because I volunteered to stuff Orientation kits for Frosh Week. And we both laughed. And laughed. And that was how, for the first time ever, I made a friend on the train. I usually thought that kind of happenstance was a Hollywood-thing, but it actually happened to me in my life. I met a nice, kind stranger, and somehow, over the course of an hour and a half, we had the sort of special conversation that you have with your closest friends, the sort of conversation where you talk about life, love, school, and more while laughing a lot. And with that, my first and only Toronto subway train friend left. After that, I became addicted to commuting to Toronto, in the vain hope of finding more subway friends and treasures. Either way, Aurora’s the reason I started #TransitHubbing. Vipasha currently stresses about physics and chemistry on Twitter a lot (@PopsugarJunkie), but her immense workload never stops her from hopping on a subway car and going down to explore T.O. as often as she can. She hopes to travel around the world one day, and perhaps, see Aurora again when she does. Have a #TransitTale of your own that you'd like to share? We'd love to hear from you! Email us at info@transithub.ca and tell us about an adventure or encounter that you've had on the subway or street car.